With nearly 27 years of experience; she brings expertise in management of television network operations in the Media and Entertainment industry. She worked as part of the leadership team at Star, Turner and HBO. She has had a consistent record of increasing business performances in the companies she has worked in. 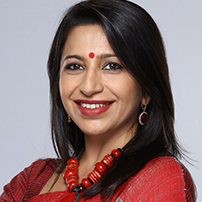 She is currently the Chief Operating Officer of BTVI (Business Television India)– India’s Premiere English Business News Channel, part of Reliance ADA Group. Her efforts were validated when she was recognized as ‘Next 30’ most powerful women to look out in 2010; and was also adjudged as one of India’s hottest young executives of the media industry in 2009 by Business Today. She is amongst the top 50 influential women in media, marketing and advertising in the country as judged by a leading industry magazine – IMPACT. She has also received Women Leadership award by World Women Leadership Congress in 2014. She was judged amongst India’s top 100 important people in the industry by Digital Studio a leading publication. She is also the Vice President of the International Advertising Association, India Chapter and was a committee member for ASCI (Advertising Standards Council of India) 2013-2015. She has been part of Jury of leading Industry awards like International Emmys, Promax, Children’s Film Festival , Golden Mikes Awards , International Women in Sales Awards , Impacts 30 under 30 and many more. Besides being involved in industry initiatives, she loves to interact with young minds and does that by giving guest lectures in leading Educational Institutes of the Country like IIT, IIM, ISB, UBS, Rims International, Jamnabai Narsee School , Wellingkar Institute of Management etc. She is also involved as a Volunteer for Isha Foundation – a non-profit organisation started by Sadhguru.